"Oh Yeah" is a single released in 1985 by the Swiss band Yello and featured on their album Stella. The song features a mix of electronic music and manipulated vocals. The song gained popularity after being featured in the films Ferris Bueller's Day Off and The Secret of My Success, among other films. It is a popular staple in pop culture. Its 1987 re-released version features the extra lyrics: "such a good time / a really good time". Describing the composition of "Oh Yeah," Blank said, "First I did the music and then I invited Dieter to sing along, and he came up with some lines which I thought, 'no Dieter, it's too complicated, we don't need that many lyrics'. I had the idea of just this guy, a fat little monster sits there very relaxed and says, "Oh yeah, oh yeah". So I told him, 'Why don't you try just to sing on and on 'oh yeah'?... Dieter was very angry when I told him this and he said, 'are you crazy, all the time "Oh yeah"? Are you crazy?! I can't do this, no no, come on, come on.' And then he said, 'some lyrics, like "the moon... beautiful", is this too much?!' and I said, 'no, it's OK', and then he did this 'oh yeah' and at the end he thought, 'yeah it's nice', he loved it himself also. And also I wanted to install lots of human noises, all kind of phonetic rhythms with my mouth; you hear lots of noises in the background which are done with my mouth." In 1987, the single reached #51 on the US Billboard Hot 100, and #36 on the US dance chart. It also peaked at #47 in Germany in November 1987 and then #9 in Australia in October 1988. The song (and others) has been aggressively shopped around, the group going so far as to produce a special "All Time Classics" CD for advertising, television and movies. The song has been wildly successful, and was the basis for Dieter Meier's investment fortune, which is now[when?] $175 million. A remix of the song, entitled, "Oh Yeah Oh Six" went to No. 1 on the US dance charts in 2006. Film critic Jonathan Bernstein observed that despite never reaching hit status, the song "has become synonymous with avarice and lust. Every time a movie, TV show or commercial wants to underline the jaw-dropping impact of a hot babe or sleek auto, that synth-drum starts popping and that deep voice rumbles, 'Oh yeah…". A 2014 article on The Dissolve website, suggests the song is used to metaphorically represent lust (in various forms) and cocaine. It was part of the soundtrack in She's Out of Control and Opportunity Knocks. The song became a conceit on The Simpsons, being used when Duffman appears; an idiomatic staple in video games; and a repeated choice in television advertisements. Matthew Broderick reprised his Bueller role in a Honda commercial aired during the Super Bowl in which "Oh Yeah" was featured. A teaser for the ad had appeared two weeks prior to the Super Bowl, which had created rumors of a possible film sequel. It was produced by Santa Monica-based RPA and directed by Todd Phillips. AdWeek's Tim Nudd called the ad "a great homage to the original 1986 film, with Broderick this time calling in sick to a film shoot and enjoying another day of slacking." On the other hand, Jalopnik's Matt Hardigree called the spot "sacrilegious". "Oh Yeah" was used in a Domino's Pizza Commercial in 2017. The commercial is a reference to Ferris Bueller's Day Off; It is an example of a repurposed pop song. The song was used in the 2017 film Captain Underpants: The First Epic Movie. "Oh Yeah" was used in the television show "It's Always Sunny in Philadelphia" on Season 4, Episode 10 "Sweet Dee has a Heart Attack". The segments of the song are played throughout the episode and the characters refer to it as the "day bow bow" song. ^ Although it did not appear on the soundtrack album. ^ Warstad 2013, p. 28. ^ "Yello: 'Oh Yeah'". Billboard. Retrieved October 15, 2018. ^ Whitburn, Joel (2004). Hot Dance/Disco: 1974-2003. Record Research. p. 285. ^ "Yello - 'Oh Yeah'". Offizielle Deutsche Charts. Retrieved October 15, 2018. ^ "australian-charts.com – Yello 'Oh Yeah'". Hung Medien. Retrieved September 23, 2015. ^ Miller, Abigail (January 27, 2017). "The 'Oh Yeah' song from 'Ferris Bueller's Day Off' made its one-hit-wonder writer $175million but he's never even SEEN the movie". Daily Mail. Dailymail.com. Retrieved January 29, 2017. Since then the song has been in dozens of movies, shows, and commercials Investing the song money in train and currency companies made him $175 million. ^ "Hot Dance Club Songs". Billboard. Nielsen Business Media, Inc. April 22, 2006. Retrieved May 27, 2014. 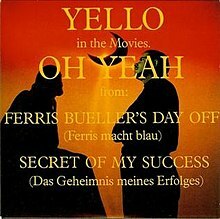 ^ "Yello – "Oh Yeah" (AKA That Ferris Bueller Song)". Jack FM, Sparknet Communications. April 19, 2012. Retrieved January 2, 2017. ^ a b Thomas, William (January 1, 2000). "The Secret of My Success Review". Empire. Retrieved December 31, 2016. ...and a soundtrack that has been hand-picked to get an audience on side. ^ a b c Munger, Sean (October 10, 2013). "Remember this song from the 80s? "BOUNT BOUNT…(chickachicka)!"". Sean Munger. Retrieved January 2, 2017. Though it didn’t make much of a splash when it was first released, "Oh Yeah" became enshrined in popular culture and its history by its inclusion in the 1986 John Hughes movie Ferris Bueller's Day Off. How a simple song like this came to almost epitomize an entire era is a pretty fascinating phenomena. ^ a b Rabin, Nathan (January 10, 2014). "The Secret Of My Success distills 1987 down to its awful essence". The Dissolve. Pitchfork Media. Retrieved December 31, 2016. [The soundtrack presents] an upbeat montage set to Katrina And The Waves’ "Walking On Sunshine," the official anthem of both the 1980s and the popular drug cocaine; and Yello's "Oh Yeah," the other official anthem of both the 1980s and the popular drug cocaine. ^ "Soundtracks for The Secret of My Success". imdb.com. Retrieved June 5, 2012. ^ Bernstein, Jonathan (1997). Pretty in pink: the golden age of teenage movies. New York NY: St. Martin's Griffin. p. 198. ISBN 9780312151942. ^ Gnoll (April 2004). "The Most Overused Songs in Movie History". Dork droppings. Retrieved January 2, 2017. You probably hear it and immediately want a Snicker's Bar, or one of the other 37,000 products that used the song in a commercial. But this little ditty from Europop pioneers Yello is also pretty common in the movies, particularly comedies from the 1980's. Immediately springing to mind is the classic FERRIS BEULLER’S DAY OFF, in which this song was used to its maximum potential. But it was also featured in several other films from the era, including THE SECRET OF MY SUCCESS, SHE’S OUT OF CONTROL, and OPPORTUNITY KNOCKS. ^ Oakley, Bill (2006). Commentary for "The City of New York vs. Homer Simpson". The Simpsons: The Complete Ninth Season (DVD). 20th Century Fox. ^ Manker, Rob (2012-01-30). "Honda releases complete Ferris Bueller ad". Chicago Tribune. Retrieved 2012-01-30. ^ a b "Honda Unveils Ferris Bueller Ad, and It Is Awesome". AdWeek. 2012-01-30. Retrieved 2012-01-31. ^ Hardigree, Matt (2012-01-30). "SAVE FERRIS From Honda's Sacrilegious Super Bowl Ad". Jalopnik. Retrieved 2012-01-30. ^ "Repurposed Pop Song". TV Tropes. Retrieved April 12, 2018. ^ "'Captain Underpants: The First Epic Movie': Film Review". The Hollywood Reporter. Retrieved August 19, 2017. Warstad, Jonas (2013). Stella: The Story Behind the Album. CreateSpace Independent Publishing Platform. ISBN 978-1-4949-3420-0. This page was last edited on 22 April 2019, at 13:39 (UTC).